Matric Recruitment MR OCT Batch 2019. Computer Based Written test (50 Marks) and Physical Tests will be conducted for this Indian Navy Sailors of Matric Recruit Batch. Written exam consists of 50 questions in this Indian Navy Sailors MR Recruitment Exam 2018. PFT Physical Fitness Test details are updated below. 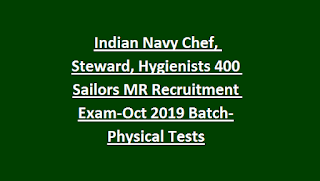 Interested candidates can apply online at www.joinindiannavy.gov.in from 14-12-2018 to 30-12-2018 for this Indian Navy Steward, Hygienists, Chef Posts. Online exam for this Sailor MR Trade will be held in the month of Feb-2019. Admit Card /Call letter will be available to download at www.joinindiannavy.gov.in by the end of the Jan-2019. 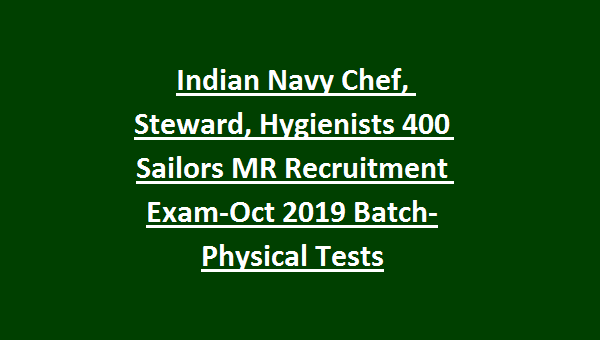 Detailed information about this Indian Navy Recruitment of Sailor MR Trade Exam Pattern and Syllabus, PFT Physical Test details are updated below. There are total 400 Sailor Merit Recruit vacancies in this Indian Navy Recruitment 2019. Those who are born in between 01-10-1998 to 30-09-2002 (Both dates inclusive) they are only eligible to apply. 17-21 years age candidates are eligible to apply. For all the posts Matriculation/SSC/10th passed candidates are eligible. Candidates selection for this Sailor MR will be based on online exam, physial tests and medical Tests. Online exam will be conducted for 50 marks. Total 50 questions will be given. Exam Paper will be given English and Hindi Languages. Written Exam duration 30 minutes. Exam Syllabus will be 10th standard level. Online exam consist of 2 sections. There is 0.25 negative mark for each wrong answer. 3. 1600 meters running to be completed in 7 Minutes. Those who are interested in above given trades they may apply online through www.joinindiannavy.gov.in website before the closing date of 30-12-2018.